LEGO was born in Denmark, the home of the Vikings, so building the realm of the Norse gods in LEGO Marvel Super Heroes using the country's number one export just makes sense. If you ask me, LEGO Asgard looks much better than the version that appeared in the live action movie a few years back. I can almost imagine LEGO Anthony Hopkins dressing-down his LEGO son from his lofty LEGO throne. 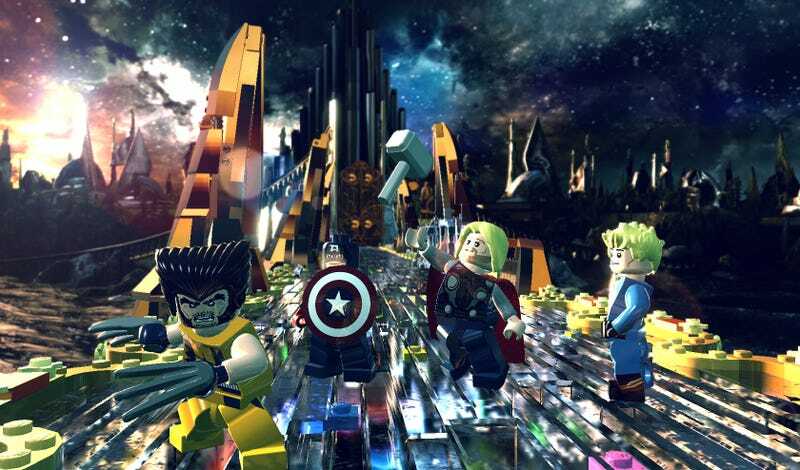 In this fall's LEGO Marvel Super Heroes, Thor, Wolverine, Captain America and the Human Torch will journey to Asgard to take down The Destroyer, likely picked because of his appearance in the first film. He's under control of Loki, of course, because he's Loki and folks like him. Check out these fresh screens for more smiling minifigs on the brink of disaster.